It was an intriguing opportunity for an interview – getting to share a pint with Raef Porter, one of the four partners at Bike Dog Brewery in West Sacramento. Porter and his partners Pete Atwood, AJ Tendick, and Sage Smith launched Bike Dog in 2013. The only thing coming close to surpassing the aroma and flavor of my Double IPA was listening to Porter talk about where they’ve come from and their passion to produce excellent beers for the greater Sacramento community. My conversation with Porter started there, with some reflections on Beer Week 2014. 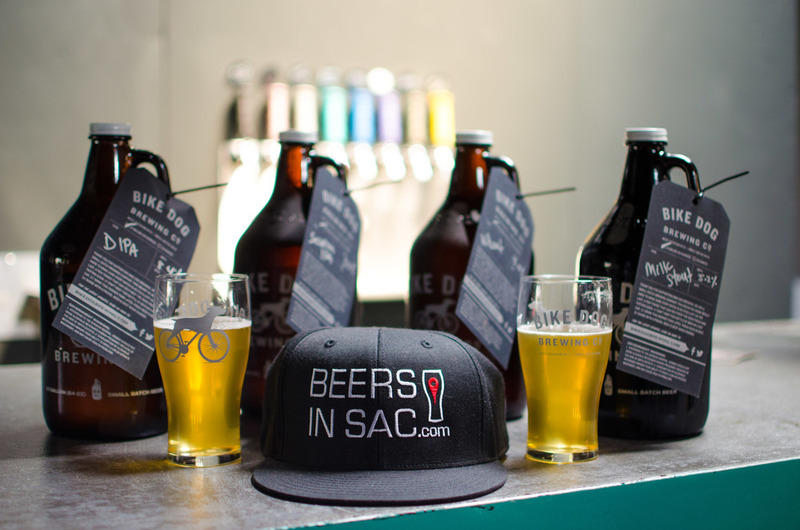 Bike Dog raised eyebrows in March with their creative brews during Sacramento Beer Week. After taking home the People’s Choice Award at the Sacramento Brewers Showcase for their Pale Ale – called the Down Under Pale Ale for its New Zealand and Australian hops – they put forth a strong showing at their taproom with events such as Stout-Fest and Hop-Fest. Taking in the events of Beer Week myself, I asked fellow craft-beer enthusiasts which beers seemed to rise above the rest. Over and over again, I heard about Bike Dog’s beers. Porter credited the hard work of the four partners, and in particular Pete Atwood, head brewer, who was measuring hops 50 feet from our table and filling the room with the aroma of hop additions. Home brewers, you know what I’m talking about. Porter, Atwood, Tendick, and Smith have all managed to carry on with full-time jobs outside the brewery, and yet their beers are well loved and the tap room is full every Friday and Saturday night. West Sac has been a huge support to Bike Dog, both from employees in the area and from the neighborhoods within the city, such as South Port. "There are a lot of thirsty people in Sacramento"
In the midst of success, Porter mentioned how grateful they are to have collaborative relationships with other breweries in Sacramento. Among others in Sacramento, he praised two West Sac breweries – Jack Rabbit and Yolo Brewing Company, opening soon, – for their craftsmanship as well as Rubicon, for their partnership and support. When asked about an over-saturation of breweries in Sacramento that might lead to fewer customers for Bike Dog, Porter felt the opposite is true. "Let's start with the double IPA"
This brings me to their beers. A Bike Dog virgin until one March afternoon, I walked into Old Soul at 40 Acres on Broadway. Sitting under the “BeersInSac.com” banner, I chose from four Bike Dog beers on tap. “Let’s start with the Double IPA,” I said. The emblem on the glass convinced me to add to my collection. Taking in the aroma, I thought I was sitting at Russian River Brewing Company smelling Pliny the Elder. I hesitate to mention Pliny, except that for many of us, the Elder has become the benchmark to which we compare all other Imperial IPAs. It’s a west coast IPA for sure, with a citrusy pineapple aroma and flavor, yet a balance that hides the 8.5% as well as any beer I’ve tried. It’s a hop head’s dream. Despite being a hop-lover’s fantasy, Bike Dog rounds out their offerings with several other beers that are more accessible to those who dislike the bitterness of IPAs. The American Wheat ale drinks smooth and is elevated by a smattering of citrus on the aroma. It lacks all bitterness and has quickly become my favorite “porch beer” after an afternoon of lawn-work. Many people’s favorite is the Milk Stout – mellow and easy to drink, but also complex with notes of toasty malt and coffee. These beers give all palates the chance to taste well-crafted brews. The line-up at the tasting room usually includes the following: Mosaic Pale Ale (5.25% ABV), Session IPA (5.5% ABV), IPA (6.7% ABV), Double IPA (8.4% ABV), Milk Stout (5.5% ABV), American Wheat Ale (6.0% ABV), and Spring Saison (6.0% ABV). "It’s amazing what a pint of beer can do"
The guys at Bike Dog welcome all palates and feel passionate about having people try a taste or two, and helping people have an experience with their beer and have a conversation about it. “It’s amazing what a pint of beer can do,” said Porter. Bike Dog extends their focus on community to Sacramento’s thriving farming and biking communities. They donate used grains to local farmers for chicken feed and are establishing relationships with several local biking clubs. May is the official Bike Month in Sacramento and they are sponsoring the “Meet Your Bike Maker” event, and host groups such as the Sacramento Bike Party. Porter, Atwood, Tendick, and Smith are guys who put their passion for bikes, dogs, and beers into a community enterprise and couldn’t get more down to earth. They are well deserving of some Sacramento love. The best news yet – Bike Dog will be open more than the usual Fridays and Saturdays. Starting May 1, Thursdays will officially become a part of the brewery’s operational hours. That translates for Sacramentans into more craft beers that satisfy all palates without having to drive two hours to Russian River or Lagunitas for a pint – or two – and some growlers to go. So check these guys out – Thursdays and Fridays from 5-9pm and Saturdays from 2-9pm at 2534 Industrial Boulevard Suite 110 in West Sacramento. Thank you, Bike Dog. Cheers Sacramento! Contact our writer Nick at nick@beersinsac.com and follow him on Twitter @Nicsbrewreview.